Sir Alex Ferguson has stated that he is impressed with Nigerian youngster, Alex Iwobi’s form for Arsenal in the ongoing Premier League season. The former Manchester United manager says the rivalry between the two Manchester clubs, Mourinho and Guardiola is good competition. “The rivalry and the experience of Guardiola and Mourinho in the Premier League make for an exciting competition, so you shouldn’t forget Arsenal. The team is more sturdy, they’ve got better and more aggressive. 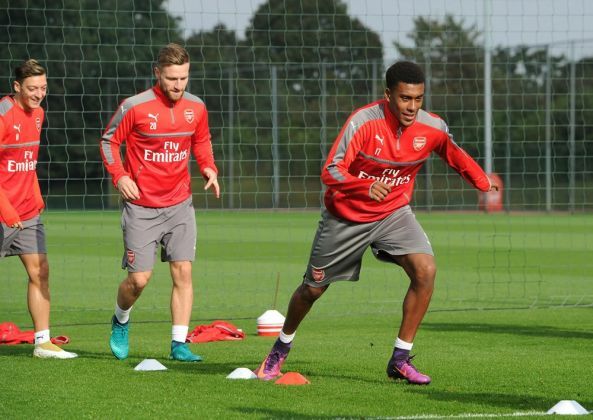 I’m impressed with the young boy Alex Iwobi. “Guardiola’s skills are beyond debate, Antonio Conte is getting Chelsea on track, but Mourinho can also rival Guardiola – he’s won the Champions League with two different clubs and titles in three different countries. Just one point separates the top five, with Ferguson’s old club six points off the pace under Jose Mourinho. “I think there are five potential candidates,” he said. “Manchester City as favourites, Tottenham and Liverpool, but also United are still there if we get some consistency soon. Even when you are trailing by six, eight points, it’s still possible to catch one or two teams. It can happen that big clubs lose it. For two decades, Liverpool changed managers without building their own identity. In addition, Ferguson says Liverpool are serious Premier League contenders now Jurgen Klopp has restored the club’s identity. Ferguson famously succeeded with his aim of knocking Liverpool “off their perch” as he took Manchester United beyond the Reds’ record of 18 English league titles. The last of those was more than 26 years ago, and Anfield has seen eight permanent managers come and go in the meantime.